January’s almost half-way through, but some of us still come up with our 2019 resolutions. And guess what, doing so you’re in the company of Mark Zuckerberg. He’s just committed to attending series of public discussions about the impact of technology on society. In the light of the recent controversy around Facebook, this sounds like a solid PR move, doesn’t it? New! Credit Karma – We help 85+ million consumers track, maintain, & improve credit health with free tools & information. New! Haufe’s wide-range of solutions empowers employees so they can make the valuable contributions your company relies on. New! 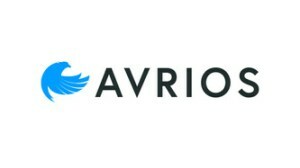 Auterion – we are the largest contributor to PX4 and the software platform powers consumer, commercial, and industrial drones of every type, from multicopters to VTOLs. New! Personio – HR managers, recruiters and executives use Personio to make their organization better and more efficient, bit by bit. New! Jobsens.ai provides you with hand-picked jobs for you to master your skills – it’s fast, efficient, and of course free. Jobsens.ai selects jobs exclusively for IT developers. New! Hubert Burda Media – Burda is a tech and media company. The media created by Burda should inform, entertain, inspire and help people! New! 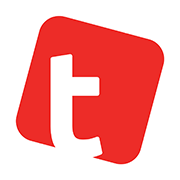 Lyska is a young tech company planning and creating web based enterprise software solutions. 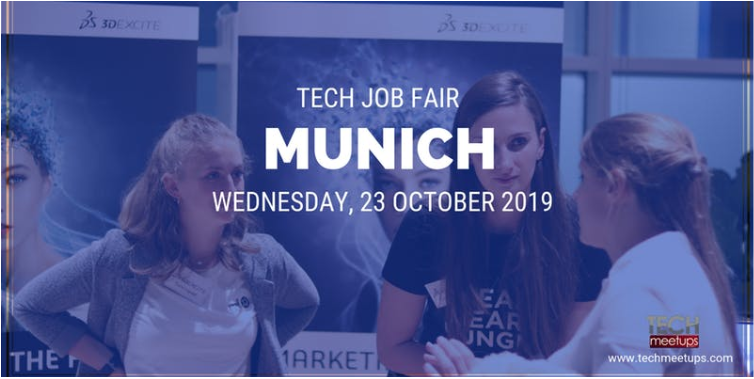 Preparing for one of our job fairs? Still feeling a little lost and not sure how to proceed? Don’t worry - you’re not alone! We understand that for many of our job seekers this is first such experience. 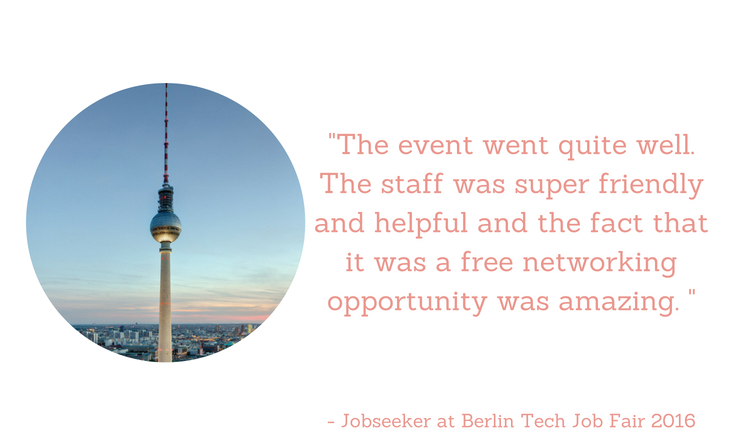 And that’s why come to you with ultimate job seeker guide that will walk you through our event! 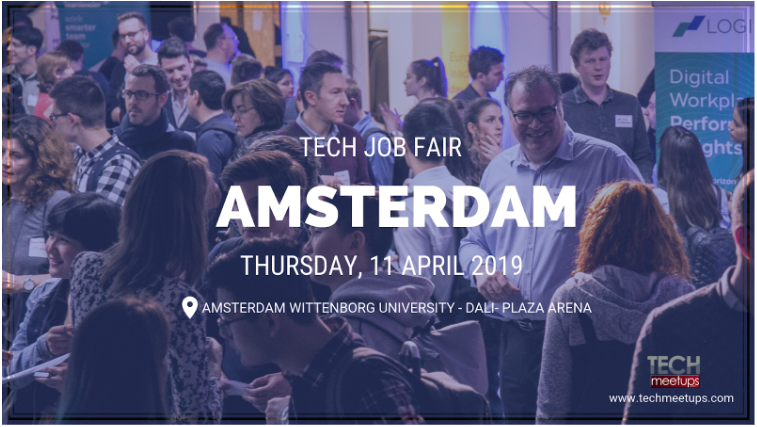 Our Tech Job Fairs are an amazing opportunity for all experienced and inexperienced job seekers across two continents. But they’re events of hundreds of people attending them, it may look like a challenge to prepare for them properly. Here’s what you should do. The most important steps to complete before the event - don’t omit those! Download, or print your ticket so you can show it upon arrival at the event. Be ready to have them prepared so you don’t spend time looking for them within your back, putting the whole line on hold. 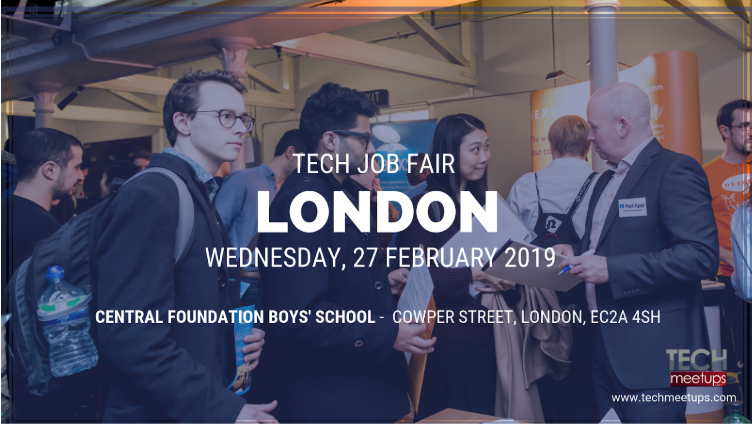 Check the event website for all companies listed and their open positions. We post company stories and informative graphics on our social media (Facebook, Twitter, LinkedIn and Instagram) and blog. Be sure to check our job board to know which company is looking for what employees. Check the venue on the map to find the easiest way to arrive. Especially if you’re new to the area, research the best commute route that will deliver you on time. Take traffic into consideration do arrive punctually! Update your CV and make many copies to bring at the event. Remember it’s supposed to be your first contact with the employer, not the last. Make sure you leave them something about you. (Read more about the resume below). Prepare your personal image. 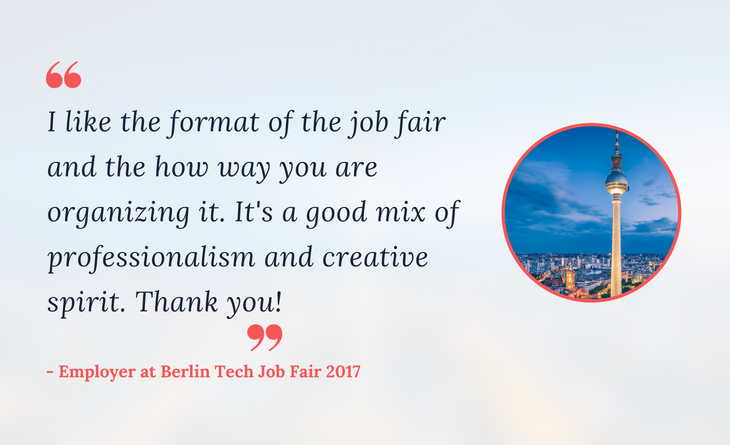 Our Tech Job Fair is the place where you first make your impressions. It’s where your potential employers see you for the very first time. Employers remember only a few of the hundreds of job seekers they meet at the fair. Make sure they remember you - dress with class and treat the fair as if it was your interview. Prepare your professional portfolio. Get ready to present yourself to the employers available at the fair. Prepare a brief presentation about who you are, what are your goals and accomplishments, what are your skills and what specific problems and challenges can you solve for the company. Practise is out loud to gain confidence and memorise it well. Prepare your resume as well. Make it job fair specific and unique. Make sure you prepare a sufficient number of copies for every company you’re interested in. 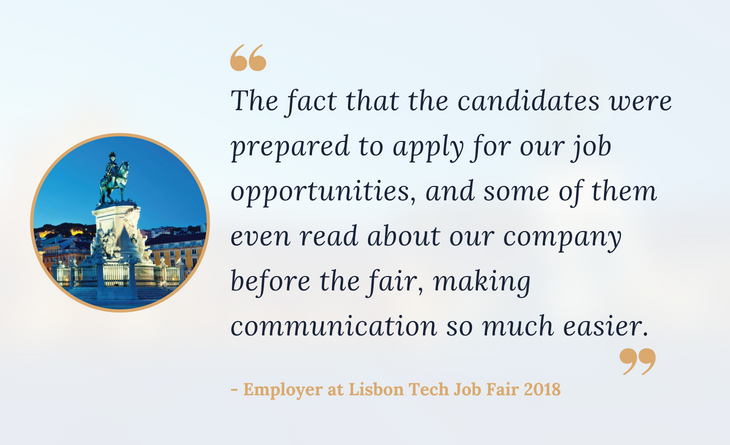 If there’s potential for on-the-spot interviewing or hiring at the Fair, take reference letters and cover letters, and assemble a professional portfolio (that contains examples of work and accomplishments). Research the companies that interest you. Learn who the companies are and what they do. Be prepared to make cogent conversation and ask relevant/timely questions to employers (this will make you an interesting and memorable applicant). Researching companies and reading the blog stories we publish about them will help you with this task. Make sure you’re ready for a conversation. Prepare questions to ask employers: what opportunities and available; what are the responsibilities; what skills are companies seeking in candidates? Be prepared to answer questions and review standard interview questions and formulate your responses. Plan your strategy. Visit booths first that interest you the most (when your energy is high and you’re at your best). Do not wonder or roam! Present yourself with a purpose. Don’t be shy – be prepared! Registration - remember these steps! Show your ticket either on your phone or printed - as we mentioned before, have them prepared in advance to not slow down the line. You will be asked to write down your name and your role on a sticky label. This will simplify networking. Make sure you write your name and position in a clear, readable way. Check out the picture above - the person on the left is an employer, the one on the right - a job seeker. Find booth locations of your targeted employers. Briskly (but attentively) walk through the entire job fair. Scope-out the employers you want to talk to. Observe which employers are busy and which aren’t. Make special note of employers that are conducting secondary interviews, either at their booth or in another location (these are the employers who are serious about hiring). Identify the person conducting secondary interviews and seek that person out! Get a feeling for the entire Job Fair. Then, go and sit for a few moments to compose yourself and to finalize your ‘plan of attack’! From a distance (about 2 meters away), observe and listen to employers interacting with other applicants. Listen to what the employer is asking. Figure out who is in charge. What happens to the resumes (are there multiple resume piles, does anyone write on them)? Determine the highest level employer-representative in the booth. Seek this person out. As you approach the table, respect other people’s privacy as they complete their interaction with the employer. Answer questions directly, politely, and concisely. REMEMBER- THE GOAL IS TO BE ASKED BACK FOR AN ‘IN-HOUSE’ INTERVIEW. Do NOT ask questions about salary and benefits (wait until later for these type of questions). If you’re given an application form, take time to fill it out neatly and completely. Write personalized thank-you letters to companies that interest you. Cite something specific from your discussion. Try to send letters out within two days after the Job Fair. It’s okay to enclose a resume with your thank-you letter. This may draw attention to your name once again. Continue to research the companies that interest you. Treat the Job Fair as an initial contact, not the last. Final Tip: Focus on learning as much as you can about what employers are looking for in the people they hire. The primary benefit of participation in the Fair is to collect information and make contacts. It’s not as hard as it looks, is it? 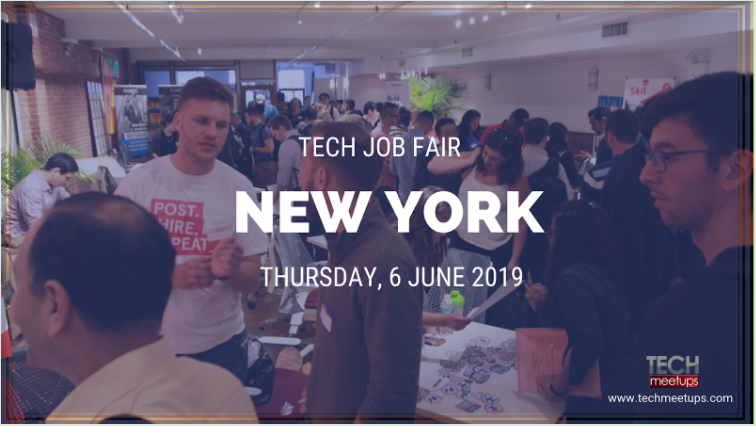 To make your Tech Job Fair successful, prepare ahead and remember our tips on what to at the venue. 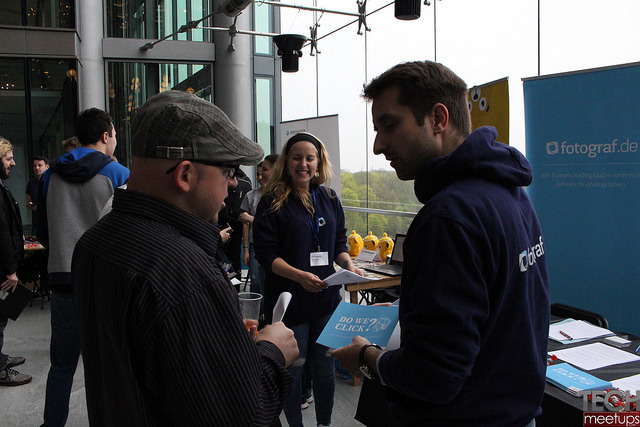 And remember - our Tech Meetups representative is always there to help you! 1. What's the story behind the creation of your company? What inspired you to start your business? Benjamin Hermann: “Get out of your comfort zone!” While this may sound like the shrill whistle call of a run-of-the-mill fitness trainer, for me and my partners it was this uneasy feeling that was our main motivation. We have both worked in similar company structures and, ironically, around 20 of our current employees have also experienced the same kind of working environment that was not creating the culture that led to a productive, creative, and forward-thinking workforce. Back then the startup hype was up and running but we saw a lack of newly established companies that really captured the potential of doing it in a different way. We had the vision to start a company which is truly diverse and scales fast internationally. 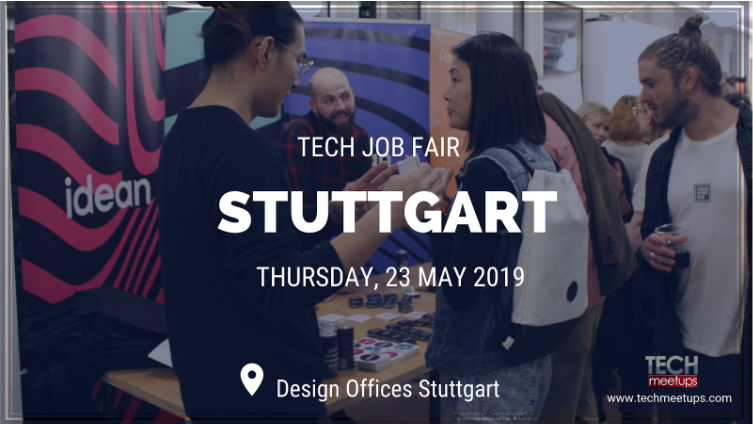 A company which is home for nerds, but also fancy and determined to ship great services to the hidden champions in the thriving region of Stuttgart, Germany, and beyond. This type of company was not existing. So we started it. Together, we shared our experiences and encouraged each other to break out of our comfort zone, to transform it, and, most importantly, to digitize it. We pushed the reset button ourselves. 2. What's your current view on the market you work in? What makes you feel like your brand stands out? Benjamin Hermann: We at Zoi are guiding digital champions with our passion for code, cloud, data, electrical engineering and creation. We are working to find unique solutions in the infinite world of cloud computing – without compromise. We are self-determined and independent. As an international team, we offer our services to medium-sized and global customers. We find and implement agile and sophisticated code solutions by combining the best of enterprise IT and cloud computing. Despite being a recent entry to the market place, we possess a great deal of know-how and remarkable knowledge of the industry. 3. What's your company culture like? What is that you want to represent? Benjamin Hermann: Zoi is the abbreviation for Zero One Infinity – underpinning the essence of IT together with our ethos and drive. The definitive between 1 and 0 or yes or no, for example. We pride ourselves on clear decisions while also being aware that there is no time for standing still, and that there is no such thing as a standard solution. We have reset everything to zero in order to resurface again within our company. We can facilitate this reset within our customer base so that progress and success can be created moving forward. And that every idea can be the start of something big. That’s why we actively foster flat hierarchies and build on the competence of each individual. 4. What is your team like? How do you work? Benjamin Hermann: We currently have two main locations in Germany and more are planned. Our main location in Stuttgart is closely linked to the successful medium-sized company structure of this region, including prominent international relationships. Our second location in Berlin enables us to be close to the digital generation. We call them “digital creatives” – a self-confident generation that handles digital opportunities creatively, intuitively, and holistically. sume and apply an entrepreneurial mindset themselves. The development of the individual is very important to us, since we are striving for a continuously evolving development process and all want to be proactively ahead of the curve. 5. What kind of people are you looking for? Who's the best match for your team? Benjamin Hermann: We are looking for idealists, digital heroes, and visionaries who – just like us – believe in the potential of digitalization. We believe in people who enjoy delivering. Shipping beats perfection - this is one of our mottos. Just as in our technological outlook, our internal focus is on people and their development. 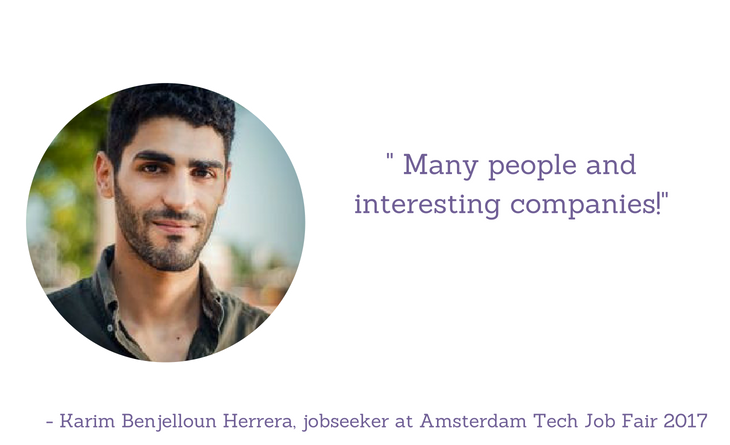 Which is why we’re always on the lookout for exciting people to enrich our team. 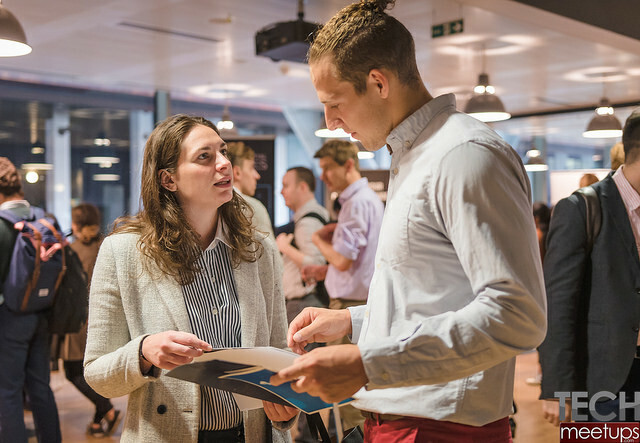 If you like finding solutions by trial and error and are looking for the freedom to develop personally and professionally, then you’ll discover that working at Zoi can be more than just a job. 6. What benefits and perks do you offer your employees? What's the biggest plus of working for you? Nothing ventured, nothing gained. That’s why 20 percent of your working time at Zoi is always available for creative technological and methodical experimentation. We enable our employees to working at their own pace to help shaping the success of our company. 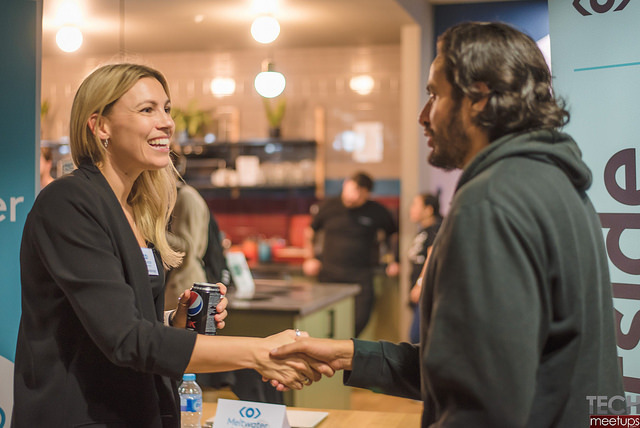 This works best in interdisciplinary teams, in direct contact with our customers, with working hours that are truly flexible – and team events that go beyond the bowling alley. Free Friday lunch and fruits, coffee and water are additional add-ons. But the most important part in my opinion is that everyone is encouraged to shape the company and to contribute equally to drive Zoi forward. 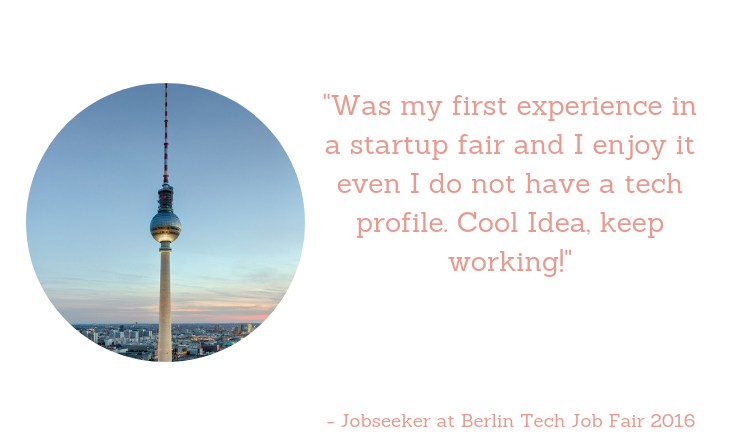 We’re here to create communities of job seekers and tech startups. 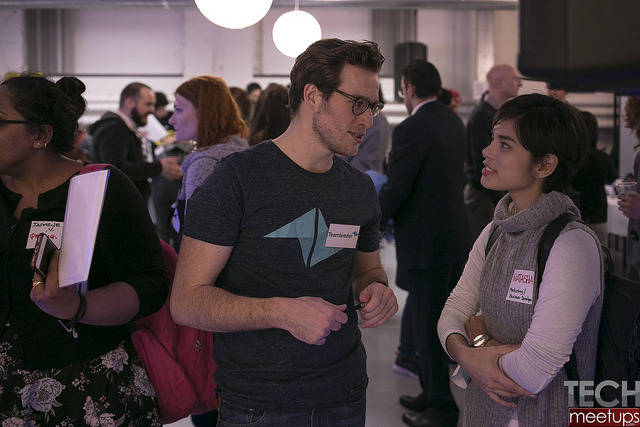 TechMeetups connect people, encourage networking and enable vast growth communities. 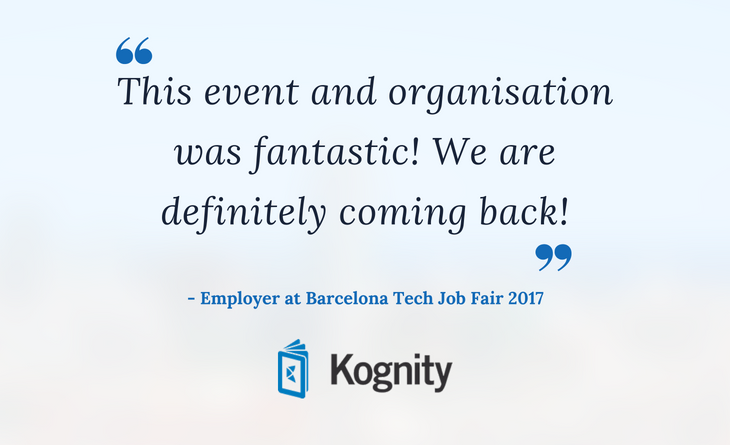 We continued to do so in the first half of 2018 which is an amazing exciting year for us, our job seekers, partners and exhibitors. 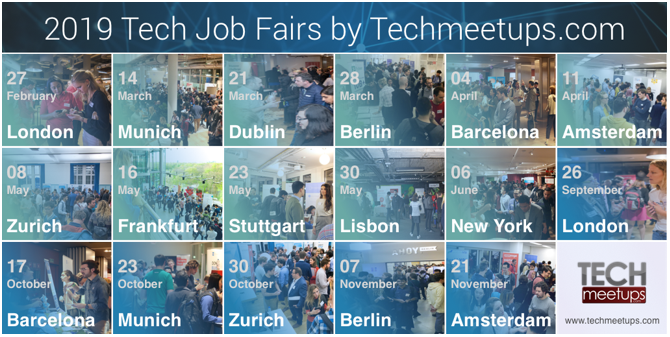 In the first half of 2018, we organized 7 job fairs on 2 continents, Europe & North America. 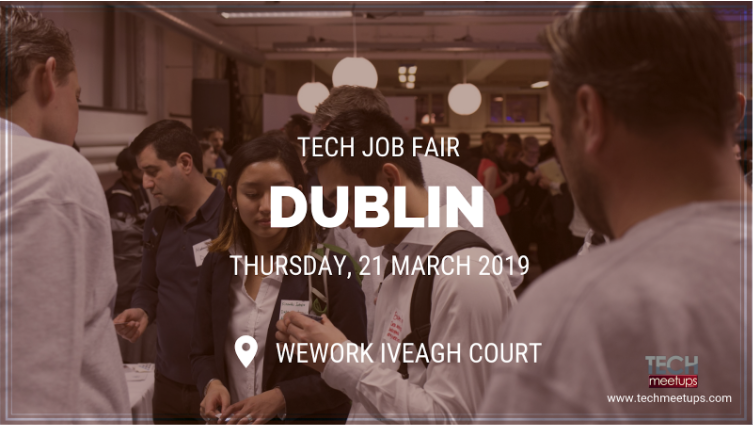 Over 150 companies have joined Techmeetups events to enjoy networking opportunities, to launch a new product, collect feedback, source, hire or get hired and generate new leads.. 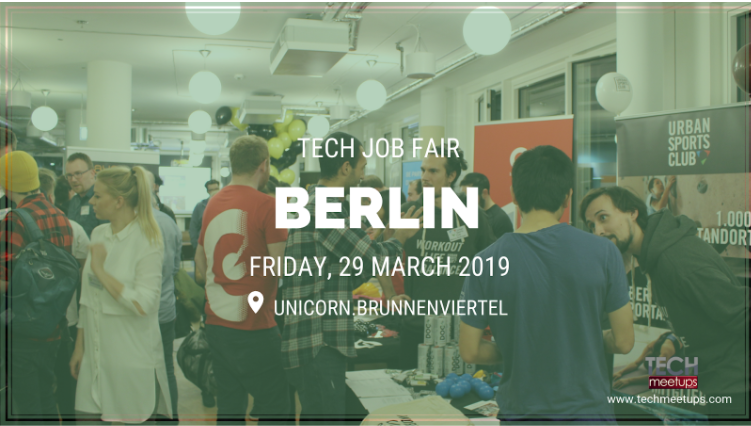 The tech scene is really booming, there's a lot of recruitment going on and on the top of the hiring cities is Berlin & NYC. 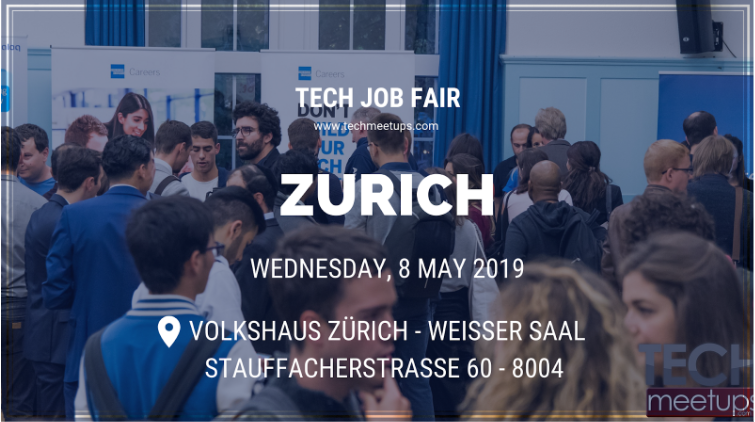 Every event organized by TechMeetups attracts hundreds of ambitious job seekers who actively seek new career opportunities. 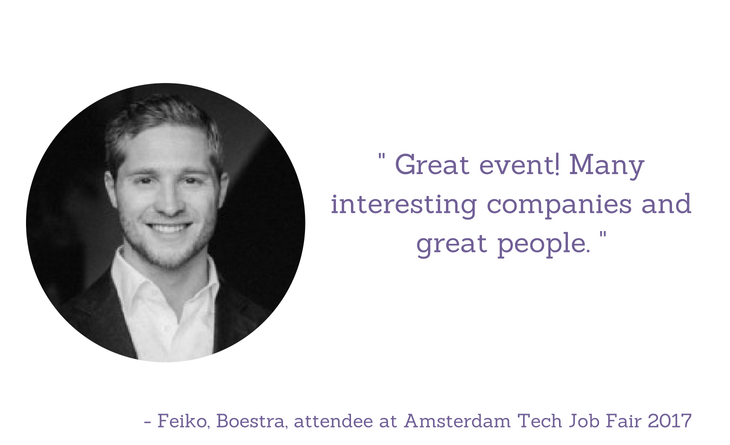 Our event attendees are open minded, proactive people who reach out to the companies with the best they can offer. Nearly 4000 attendees participated in our events in the first half of 2018. 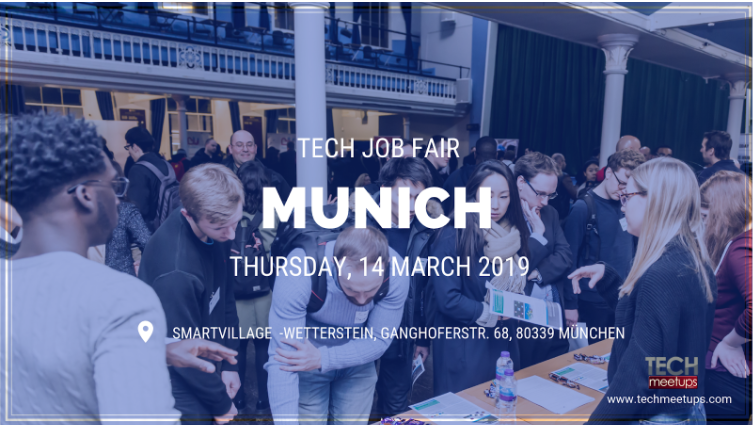 Among the job seekers, the most popular events where the London and Berlin job fairs - respectively over 700 and over 500 attendees. 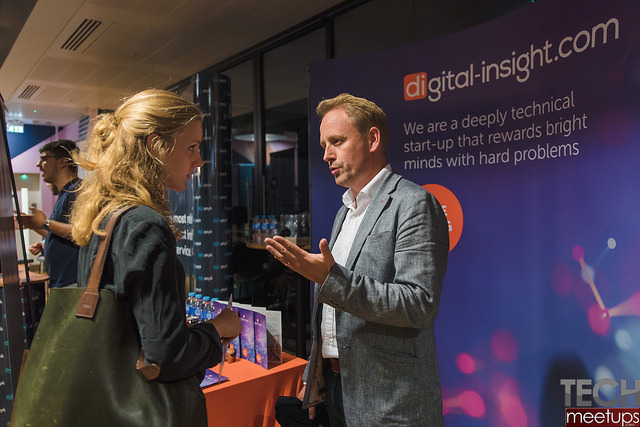 What do our exhibitors and jobseekers value most about our events? Gathering testimonials from our attending companies gives a clear insight of what they value most about us. 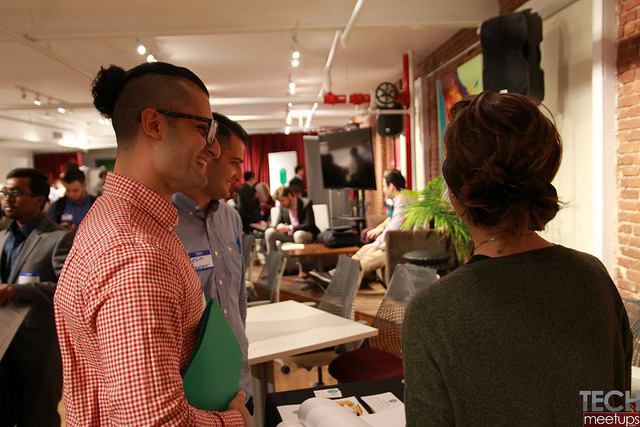 TechMeetups are here for the companies and jobseeker to provide value in the field of career and networking. 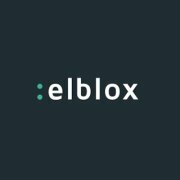 We’re always open for your feedback and tips, chances of cooperation partnership. 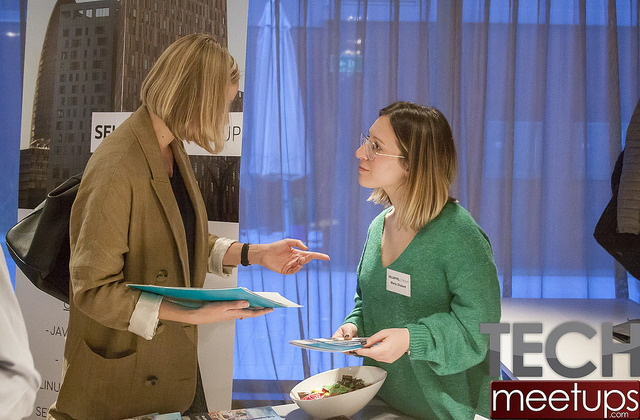 Don’t hesitate to reach out to us - our friendly and open-minded team is waiting for your message at social@techmeetups.com ! 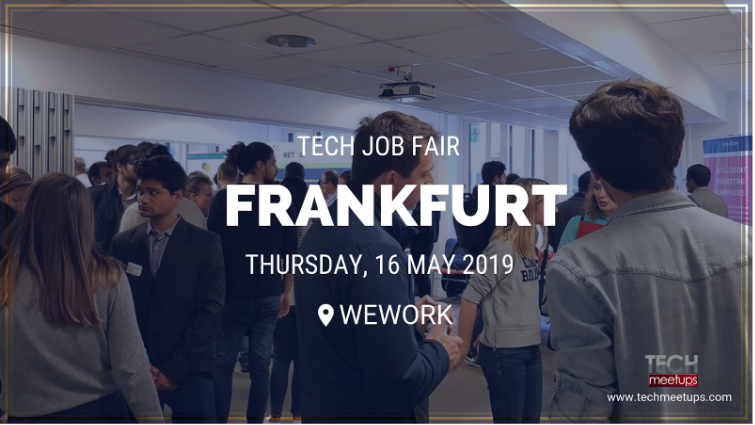 TechStartupJobs Fair Berlin 14th May 2014 held at Berlin, Germany, Supermarkt. 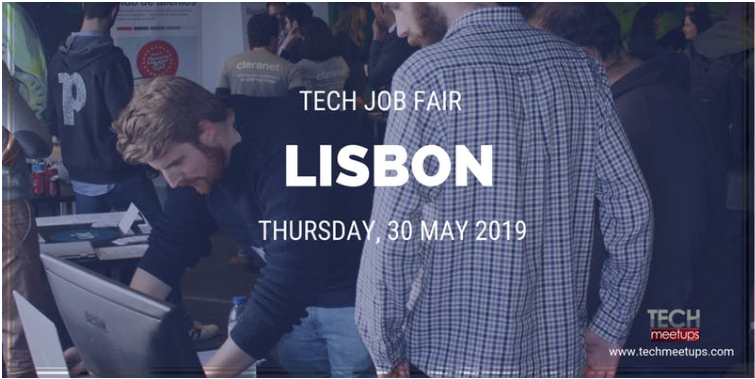 Our silver sponsor was Babbel.There were number of startups who took stand including Kaufda, Outfittery, GetYourGuide, Native Recruitment, DaWanda, HitFox, Billpay,Kisura, Jesta Digital, SponsorPay, Kayak, Payleven. 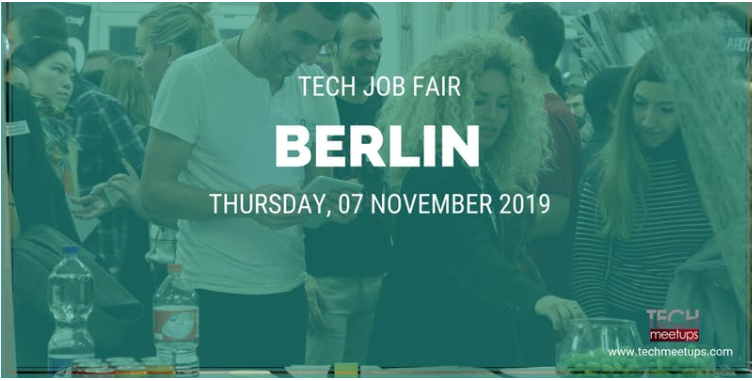 Some other companies who warmly participated in the event are Glispa, Project Zeta, softgames.de, Careerteam, lock8.me and NewBank. Unemployment rates have fallen nationwide but there are still nearly 12 million active job seekers who cannot find work. A recent study by the 27/7 Wall Street identified the states where residents had the best chances of finding work and also received the best benefits while they were looking. Four of the top five border South Dakota. While the Mount Rushmore State doesn't make the top 10, unemployment here remains about half the national average. This comes after a slight rise in Sioux Falls' unemployment from May to June. People with full-time jobs wanting to add a little something extra to their schedules, and their paychecks. Either that, or many others are retired. SMG Sioux Falls President Terry Torkildson says, when it comes to finding new part or full-time hires, even that can bring a few challenges.